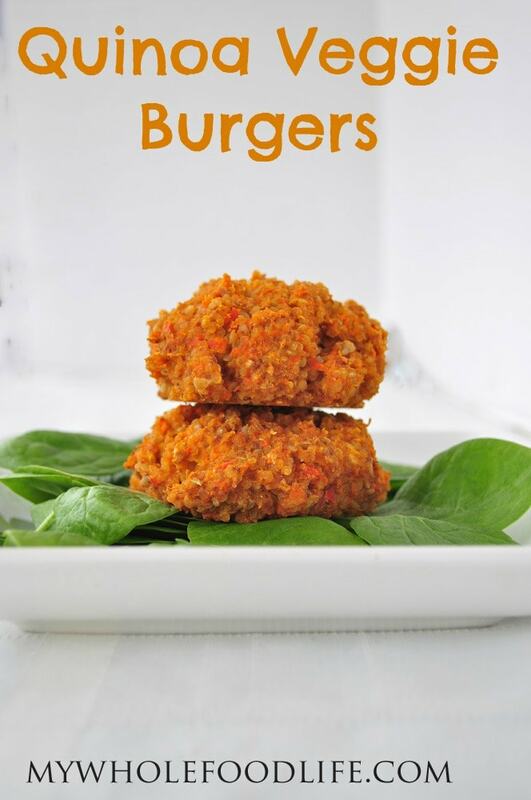 These quinoa veggie burgers are so yummy! I just love a homemade veggie burger. Don’t you? I have several of them on my blog already, like my Sweet Potato Veggie Burgers, Black Bean Veggie Burgers and Chickpea and Spinach Veggie Burgers. Well here is a new quinoa veggie burger to add to the list. The best thing about these veggie burgers is that you probably already have the ingredients to make them! I often make veggie burgers is a double batch and freeze some for easy meal ideas. A healthy and simple recipe you will love! In a food processor , combine the onion, red pepper, carrot and celery. Pulse a few times. Add in the remaining ingredients and mix well, scraping down the sides often. Form the mixture into patties and place them onto a lined baking sheet. Bake for about 12 minutes, flip the patties and bake for another 10 minutes. Store patties in an airtight container. They should keep 7-10 days in the fridge and you can also freeze them. Can you kindly explain flax eggs? I have no clue! Can I use regular eggs? Also can we use Bulgur(cracked wheat) in place of quinoa? I use flax eggs because I am vegan. Here is how you make them https://mywholefoodlife.com/advice/how-to-make-a-flax-egg/ You can also use real eggs in place of flax eggs if you eat them. Thanks Melissa for the recipe, I'm making this for the second time for dinner tonight and I was wondering if you have a dip or sauce to go with the veggie burgers, thanks in advance. By the way this are delicious my whole family love it. So glad you like them Nina! I usually eat them with a little avocado spread on top. I also like to use veganaise on occasion. Just made there for my breakfast with some cooked spinach on the side. Very tasty. I used brown rice flour and a real egg since this is what I had. Really need to get busy and try your flax eggs. I know they will be good for me. So glad you liked the recipe Marilyn! Is the 1 1/2 cups cooked quinoa mean you cook 1 1/2 cups or use 1 1/2 cups of already cooked quinoa?